I think the key to any great blog is having beautiful photos that really engage the reader. You don't need to have fancy editing software to achieve amazing photos but I thought I would share some of my tips on how I take my photos for my blog posts. Arrangement- If you can arrange the layout of your photo in a professional way then you're half way there in taking lovely photos. When taking blog photos I'll often take a number of pictures of different arrangements before I'm happy with the final photo. I also think that it's good to try different compositions to see what works for the post. Background- I like really clean backgrounds as I think they place more of the focus on the products and make them stand out. I've recently been taking all my blog and Instagram photos on these wooden floorboard panels as I think it gives a really clean look. I think it's also good to make your photos recognizable to your blog so that when people see an image they associate it with your blog. Movement- I often find that when a photo looks boring it's because there isn't any movement or life in the photo. By that I mean using your hand to hold a product or adding in props like flowers, candles or jewellery to make the image a bit more exciting. Editing- Once I'm happy with photo I will then begin to edit the amount of light in the photo because I think bright and white photos look really nice on blogs. The quickest way to make the white in photos really bright is by adjusting the curves, this brightens the whole image and generally makes everything look really crisp. I will then increase the sharpness to make everything really clear and stand out. Camera- You don't necessarily need an expensive or fancy camera for blog photos as I think iPhone's take really high quality photos. I use the Canon 600D camera with an ESF 18-55mm lens, which takes really lovely photos and blurs out backgrounds really nicely. It's also the camera I use to film all my videos for my YouTube channel. If you love taking photos and want to really give running a blog a good go then I would recommend buying a decent camera as it makes a big difference to your images and overall look of your blog. As the sun is starting to shine a little more I purchased some new sunglasses from the Toyshades pop up shop in Topshop. I find that the shape of these kind of sunglasses suit my face as they're a little larger than Ray Bans and smaller than oversized glasses. Along with my new shades I've still really loved layering delicate necklaces. My new love is this Moon necklace from Astrid and Miyu, which my brother got me for my birthday, paired with a star necklace I picked up in the River Island sale for £1. Lastly, my next new favourite is this beautiful blue aztec scarf, which was another birthday present. It's a realy light weight scarf, which I think will be so perfect when it gets a little warmer and I think will look really nice with white jeans and brown boots. I often talk about my love for eyeshadow palettes on my blog and never actually mention the single shadows that I love. I think because I've loved these 5 for so long I forget that I've never dedicated a post to them on This London Life. Maybelline Creme Colour Tatoo in On and On Bronze is probably my all time favourite shadow. The colour is a beautiful easy to wear bronze and the cream formula makes it really easy to apply and blend out. Another cream shadow I love is Initiation from Chanel, and this is one that I bring out for parties as it's more of a packing on the glitter kind of shadow. I find that it works really well when applied with fingers and I tend to wear this over another shadow bronze. Similarly to the Chanel shadow I also love wearing the Bobbi Brown Sparkle Shadow in White Sand over other bases. This one has more of a silver shimmer to it than bronze, which I really like to give a different look. Again I find that the best way to apply the sparkle shadows is with your fingers as it really helps with packing on the glitter. The next shadow I use most days is Mac Mulch, it's a very easy shade to wear all over the lid or blended on the lower last line. It's described as a a red/brown with bronze pearl shade and I think it's the mix of colours, which make it such a beautiful shadow. Lastly I thought I'd include a shadow, which can be used both wet or dry and the Nars Duel-Intensity Eyeshadows are the best I've found. I own a few of the gold/silver ones of these but I really love the shade Subra as it comes out as a beautiful purple shade on the lids. I love wearing this lightly pressed on top of other shadows but when applied with a wet brush the colour is so beautiful and intense and perfect for smokey eyes. Smashbox Be Legendary Long-Wear Lip Lacquers are the new lip products that really bring it when it comes to long lasting lip stains. Firstly they come in a range of 20 different wearable shades and are some of the most long lasting lip stains I've used. Unlike other lip lacquers, they're not drying at all and give a really juicy looking effect to the lips. They also contain Vitamin E, which is what adds to the non-drying effect and keeps your lips looking moisturised throughout the day. I have the shades Fuchsia, which is a very bubblegum pink shade, Firecracker, which is an orange toned red, Legendarya classic bright red and After Dark, which is a beautiful deep purple shade. After Dark would have to be my favourite shade as I love deep purple lip colours and I think when you wear a dark lip it makes all the difference when it's long lasting! You can pick up the Smashbox Be Legendary Long-Wear Lip Lacquers from Boots both online and in larger stores. I generally don't lean towards sweet fragrances as I prefer more musky and floral scents, but I've recently been trying out the new additions to the Philisophy Fresh Cream range and it may have just converted me over to the sweeter side of scents. Although the name suggests this range would have a sickly scent there is also a mix of vanilla, sweet macadamia, and soft floral notes of almond blossom and heliotrope to balance it out. I've been trying out the Fresh Cream Eau De Toilette (£34) and the 3 in 1 Shower Cream, Bubble Bath and Shampoo (£19.50). Even though the range is on the sweeter side I would also say that due to the mix of other ingredients it ends up having quite a musky more mature feel that you would expct. I love the Philosophy shampoo, shower cream and bubble baths because they create really lovely bubbles for baths and lather up really nicely in the shower. I find they leave the skin feeling silky soft and this scent is one that's lovely to use in the evening before bed as you go to sleep to the sweet scent of vanilla. I don't ever use these as a shampoo but if you're not fussy about shampoo then I can imagine having your hair smell of their scents would be lovely. The perfume is a balanced mix between sweet cream and musk on the skin and and I found that the scent lingered throughout the day, which is definitely what you want. This range as a perfume definitely isn't for everyone as I think it's probably aimed at younger girls but it's definitely an interesting scent and worth a sniff! I know I said I wasn't going to do a gift guide for Mother's Day but when I saw this duo of mini Diptyque candles I just couldn't not recommend them to you. The set contains a 70g candle of Baies and Tubereuse and costs £38, which I actually think is quite good value for money for Diptyque as there mini candles aren't quite so mini compared to others brands. I personally think they have picked two of the best smelling candles that they sell as both Baies and Tubereuse are two of my favourite scents from the brand. Baies is the scent of a bouquet of roses sweetened with blackcurrent leaves and smells fruity, sweet and musky. Tubereuse smells of the intoxicating flower itself and gives off a very musky floral scent. I would say Tubereuse is my favourite of the two as it's different to anything else I own. If you know your Mum or Grandma love candles but haven't tried Diptqyue before, then I would say that this duo would be the perfect gift as both scents are hard not to like and are a good introduction into the brand. The mini duo giftset can be bought from Space NK both in store and online. Instead of doing a gift guide for Mother's Day this year I thought I would just give you a general idea of making a pamper basket and tell you some of my favourite pamper products that I think any mum would love. I'm not a mum so I can't speak from experience but I can imagine it's pretty tiring, espeically for new mums, and the best present you could give them is a set of products to truely pamper and soothe. My top pamper picks for the body would be the Clarins Tonic Treatment Body Oil, it smells absolutely divine and leaves your skin feeling silky soft. I also love the Frangipani range from Elemis and their body cream is absolutely beautiful both in smell and in how it leaves your skin. Lush do some amazing bath products that give the most relaxing and soothing bath. I absolutely love their Bath Melts and my favourite of theirs is Dreamtime as it contains Lavender Oil and organic Cocoa Butter. 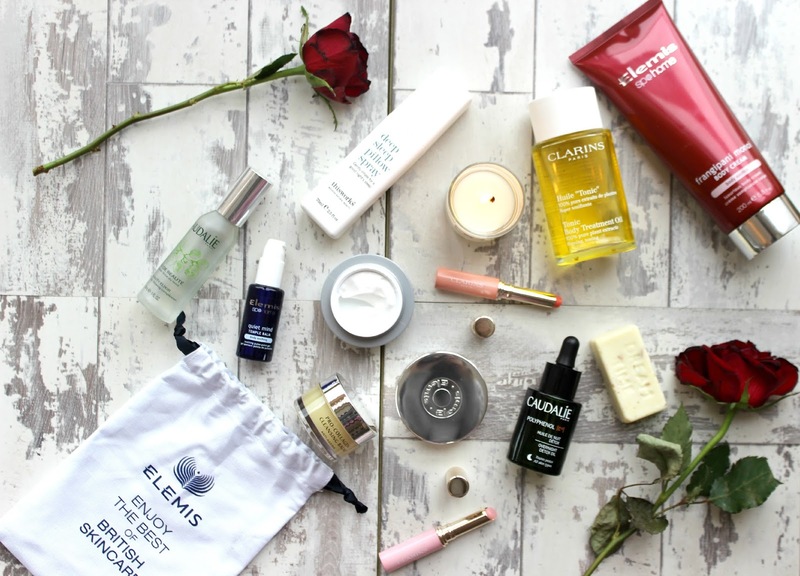 Along with the Elemis bodycare I also love their skin care and would recommend their products to anyone. The 3 Piece Quite Mind Night Time Skincare Trio would be a great gift alone as it contains the Cleansing Balm, a night cream and a Quite Mind Temple Balm. My other favourite skincare brand is Caudalie and I've picked the classic Beauty Elixir and the Overnight Detox Oil for a pamper night. Then of course it wouldn't be a pamper basket without a beautiful candle, and the one I picked in the above picture was one of the minature Jo Malone London candles in English Pear and Freesia. As a little extra I've also included a few of the new Clarins Instant Lip Balm Perfectors as I absolutely adore these and have recommended them to anyone who will listen.The last thing I wanted to include was the This Works Deep Sleep Pillow Spray because I find this stuff always helps me have such a solid nights sleep and the scent is really relaxing and calming. It's no secret that I enjoy cocktails, they're my favourite way to catch up with friends after a long busy day at work, and living in London means they're plenty of places to go to. After recommending my favourite London restaurants I thought I should let you in on my favourite spots for cocktails. I've tried to include a range of different places for different budgets so hopefully there's something for everyone! I absolutely love Kettners, I think it has such an amazing feel to it and makes you feel like you've walked into a completely different era. They do an amazing range of cocktails and Monday-Thursday they have a happy hour 8-close, which is probably one of the best ones you'll find in Soho! Sushi Samba, has one of the best views of the city. It's located one the 38th floor of Heron Tower by Liverpool Street and has a panoramic view of London. You can go without a reservation, but I would recommend trying to get there before 6.30 to make sure you get a good spot by the window because it does get busy. The cocktails cost around £7-£8 but they're really nice and totally worth it when you see the view! Earlham Street Clubhouse can be found in Seven Dials in Covent Garden and it's an underground american bar that serves cocktails and pizzas. There is a happy hour between 5-7 and all the cocktails have really cool names that are either 90's song names or the names of classic films like Gangsters Paradise and No Scrubs. Mayor of Scaredy Cat Town is the secret speakeasy bar that can be found behind a fridge in the Liverpool Street Breakfast Club. Like Sushi Samba, I would also suggest getting here before 6.30 as they don't take reservations and it gets super busy! The cocktails are between £8-£9 but they're really good and their Mac and Cheese is the bomb! Hakkasan is my favourite restaurant in London but you can also go and sit at their bar for drinks and let me just say, their cocktails are freakin amazing! This is definitely the most pricey from the list so I would say Hakkasan is for special occasions. There are two Hakkasans in London, but I love the one at Hanway Place, which is right by Tottenham Court Road, so it's perfect if you want to go on to somewhere else for dinner. Bob Bob Ricard is similar to Kettners in that it makes you feel like you've been transported to another era. I'm a big fan of the food at Bob Bob Ricard but I also love their cocktails, plus each booth has a 'Press For Champagne' button, which my friends and I used a little too much at our last visit! If you have any places that aren't on this list and you love then please let me know as I'm always up for finding new restaurants and bars! If you follow me on Instagram you will have seen me post a picture of the new beautiful shades Laura Mercier has added to the Crème Smooth lipstick range. I have 4 of the new shades but there are a total of 7 launching in March. All of the colours are very wearable shades for both day and night and they're all very 'Spring like' shades, due to the creamy and pinky shades. My favourite is the second one in on the second picture called Rose as it's such a lovely dusty rose colour, which is the colour lipstick I wear every day anyway. The formula of the lipsticks is very easy and comfortable to wear. They feel very creamy on the lips and look really smooth once applied. All the lipsticks contain olive oil and Vitamin E, which is what makes them feel super smooth but also hyaluronic filling spheres, which plump fine lines and repair delicate skin and finally rose seed extract to help restore elasticity. I absolutely love when make-up contains something to actually look after your skin as it feels like you're getting so much extra for your money and I'm a huge fan of what these lipsticks do to my lips. Laura Mercier Crème Smooth Lipsticks can be found in nationwide stores or online at Laura Mercier.